It was a day that required bright, clean flavours. Something to celebrate the hesitant change towards summer. 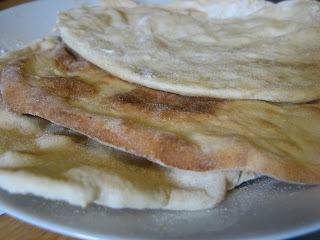 So I made pita breads. 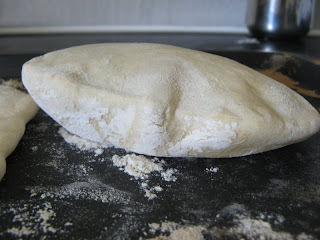 Two and half cups flour, a cup warm water, a squirt of peppery olive oil and tablespoon each of yeast, sugar and salt. Then kneading, a bit more flour, more kneading, until I had a coherent ball of warm, living dough. When my children want pets one day, I'll give them yeast and flour. This cuddly animal lived happily for 30 minutes or so, looking fat and content in its covered bowl. Then division into granadilla-sized balls. (This is a food blog, so no mention of golf balls allowed.) These are out rolled very thinly - 3 to 4mm might even be too much - and baked uncovered at as high a temperature as your oven can handle. The theory is that the high heat should allow steam to form inside the bread, making it puff up into a balloon that forms the characteristic pockets I was craving. This is where it gets interesting. The first two went into the 250'C fan oven, 8 minutes later they still looked pretty flat, maybe with one or two spots that wanted to puff, but these were kept in place by peer pressure. And they were pretty toasty. The next bread was almost the size of a dinner plate - I had rolled it out really well. 6 minutes gave it a few more bubbles, less toasty this time, but still no pocket. Then two more, normal sized again. And they came out beautifully! The whole bread swelled up, exactly as promised! When I removed it from the oven, it slowly deflated again. I think these might have been more uniform, or slightly thicker than the others, or had rested a moment between rolling and baking, or maybe they just really liked me. The remaining four all puffed temperamentally, not great, but nothing a gentle knife edge couldn't fix. I took the best one first, halved it, and slathered a generous blob of hummus inside the cavity, a scoop of tomato and onion salsa (a coarsely chopped tomato, half a raw onion, also chopped, with salt, parsley, lemon juice and olive oil), a sprig of basil and as much lettuce I could fit inside. 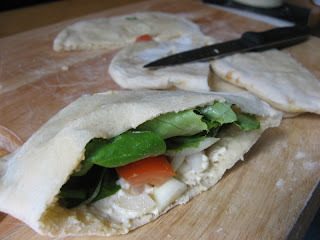 The breads which didn't puff up were still good folded around the filling (also squashed or used as scoops). The result was lively and fresh: crunchy inside, with a just-right chewy crust. It will be repeated, and next time all the breads will behave. Oh yum. Gotta make hummus.